First, Cowtown Computer Congress finally got blueprints of the building our hacker space will be located in. That's good news. The bad news? 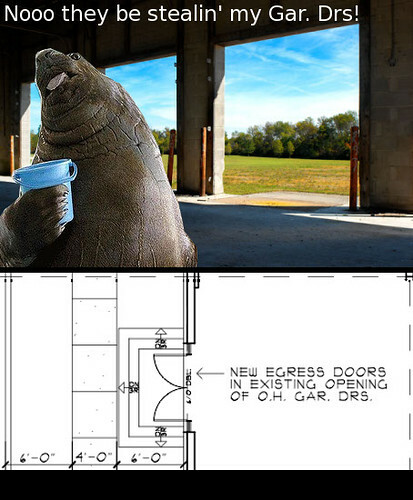 The awesome garage door we thought we'd have might be on the chopping block according to the blueprint -- as shown below the lolrus (which is actually a huge seal since it doesn't have tusks) Not cool. We're gonna try to have them leave the garage door. Also, CCCKC will be thowing a "build it for them to throw it" party on Nov. 22, a few days before the Plaza Lighting Ceremony. This event for CCCKC members will get a bunch of geeks together to build LED Throwies. The plan is to use the throwies for the fund-raiser on the 26th. What better time of year to lob magnetized LEDs at things than the official kick-off of Kansas City's Holiday Season? Become a member of CCCKC, come out and help us build some throwies, and then kick it with all of us at the next fund raiser.